"Digital photography enabled the project's organizers to simultaneously solicit and receive photographs from thousands of communities across America via the Internet. Digital technology, from cameras to software to the Internet, enabled Americans to tell their own stories in a way that's never been possible before." DK has a worldwide reputation for publishing high-quality nonfiction books. "America 24/7" takes their vision a step further. Now you can design your own custom cover. If you have always wanted to have your picture on the cover of a book, your day has arrived. 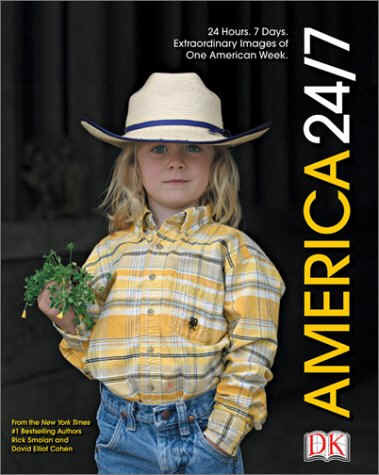 Yes, you can now order a personalized cover for "America 24/7." This could get rather interesting and surprise a number of your family members. "We didn't know you were famous" they will say as they enviously view your beautiful picture in all its glossy glory. Or, how would you like to surprise your friends and family with "their" picture on this gorgeous coffee table collectable? The possibilities are endless: birthdays, graduation, anniversaries, baby showers, "just because" presents, "I think you are amazing" presents or "you’re the best friend on the planet" presents. Is there anyone who would not love a custom cover? What about all your pet loving friends who would go wild with happy puppy/kitten joy to see their dog or cat's picture on the cover of a book. As you can tell, I was rather excited about the possibilities of putting photographs of my cats on a book cover. Better yet, I had found a picture of my grandmother holding a cat on her shoulder that is quite unique and artistic. The ordering process was professional and within minutes I could see a picture of the finished product – "a glossy high quality customized wrap-around dust jacket." Now that is what I call amazing! The picture I used was also rather small before I scanned it and I was impressed with how well it turned out on the picture of the cover. My Custom Cover! Grandma Clarice (right). To order a custom cover, you go to the URL listed on the back flap and then upload an image that has been taken with a 1.2 Megapixel camera (640x508 pixels). For even better results, use a photograph that was taken with a 2 Megapixel camera or greater (1200x940 pixels). The maximum file size is 5MB. You can also scan a picture. In seven steps you have your custom cover and it is ready to ship. Apparently there is an overwhelming demand for the covers. There are six chapters: Hearth & Home, Hard at Work, American at Play, Reason to Believe, Our Town, and Sea to Shining Sea. Each pictures shows America as it is, what was happening in 2003 and this is literally a 2003 time capsule of photographs. DK has planned 50 more books, one for each state, so look for a book about your state in the Fall of 2004. You can already pre-order a copy featuring your state! The scale of this project was immense and Rick Smolan and David Elliot Cohen (The original creators of the "Day in the Life" series of photography books) brought together the finest technology services for every publishing step. The sheer talent that went into creating this work of art takes your breath away. 25,000 photographers spent one week shooting digital photos of American life. More than one million photos were taken in the week of May 12-13, 2003. Not only does this 304-page, hard-cover book feature over 1,200 photographs, there are six 750-word essays introducing each chapter. This book was selected as one of "Oprah's Favorite Things" in November 2003 and I can see why. You can even order a framed or unframed photograph from this book. "Monument Valley, Arizona" is definitely worth framing! There are so many beautiful photographs, but the picture of "Nine-year-old Nora Garcia cuddling her baby sister" is angelic. My favorite picture is of Charlotte Day-Reiss reading books with the sunlight filtering in through the window and it made me nostalgic for days gone by and afternoons reading in bed. I'm sure she is a reviewer of the future! I had a good laugh when viewing the picture of Kari Lloyd-Jones trying to do yoga while her son, Ian, joins in. There is also a spectacular picture of the seventh-floor garden at Rockefeller Center in New York. I had to look twice, then, kept looking at the "Longaberger Headquarters" that is a seven-story replica market basket in bright yellow. I was also amazed to find a picture of Mt. Rainier, a very dangerous volcano in the Cascades looming above the Seattle area and a picture taken in Pike Place Market. We hope Mt. Rainier stays beautifully capped in all its snowy glory. This is the America we know and love. You will recognize the true-life settings as a mirror of your own life and be amazed by the creativity and adventurous spirit of the photographers. 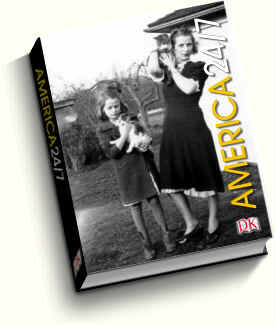 America 24/7 is an authentic and creative photographic journey into the real America we embrace in our daily lives. This is a book about family, growing up in America, home, celebrations, religious traditions, adventure, sports, nature, reading story books on the porch and the simple breathless beauty of everyday life. I can't wait for my custom cover to arrive! P.S. Do they plan a "Day in the Life of a Cat" version? It could include pictures of Cats from all over America or the World. Now there is a book I want to buy. 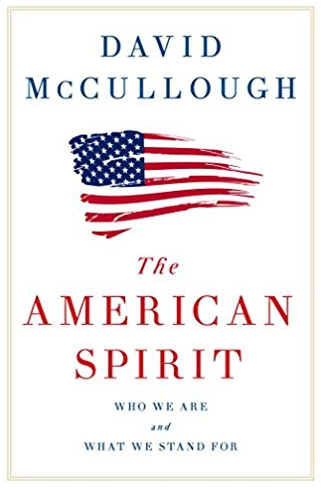 "A Day in the Life of America"
Historian David McCullough is aware that America is divided and in this book he seeks to remind us all of why we are Americans. This is a book of speeches given over many years. Some of the speeches explain how Americans want to be part of something larger than themselves. The message is also that we should be thankful to all those who have gone before us to gain our freedom. There is a call to action to stay faithful to our beliefs. By reading this book you will learn interesting facts like that there is a tree that is 4,700 years old and that John Adams carried a book whenever he traveled. There are also some good book recommendations. Who was the presidesnt who established the Grand Canyon as a national park? Who are we and what do we stand for as a nation? What can we do about the thousands of homeless on our streets? There is an interesting chapter on presidents and what they did and didn't do. One paragraph about all the things a president has access to was intriguing. 35 limousines! And who knew that the Library of Congress had 650 miles of shelves with books in 470 languages. That is pretty amazing. What this author concludes is that the American spirit is still at work and that we can solve America's problems if we really put our minds to the task.